Corsair markets a new 4GB DDR3 for Apple Mac desktop and laptop computers. It offers 1066MHz clockspeed and 7-7-7-20 timings at a voltage of 1.5V. You can get it as a 4GB module or in a 8GB dual-channel kit. Corsair®, a worldwide designer and supplier of high-performance components to the PC gaming hardware market, today announced worldwide retail availability of 4GB DDR3 memory for Apple® Mac desktop and laptop PCs. Corsair’s Mac memory kits are tested at Apple Developer Compatibility Labs and are guaranteed to work with any Mac desktop or notebook PC that supports 4GB DDR3 SODIMMs, including iMac®, Mac mini, Mac Pro, MacBook®, and MacBook Pro models. This includes virtually all models offered by Apple since 2010. The new DDR3 Mac memory upgrades, like all Corsair DRAM products, are tested to exacting standards and come with a limited lifetime warranty. "Macs are often the platform of choice for video production, photo editing and graphics design, and these applications require lots of memory." said Giovanni Sena, Director of Memory Products at Corsair. 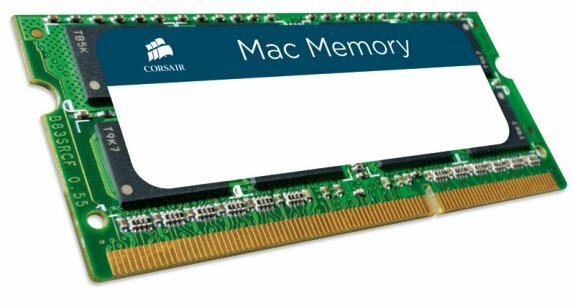 "With hassle-free compatibility and renowned Corsair compatibility and support, our new Mac memory upgrades are a smart performance investment."